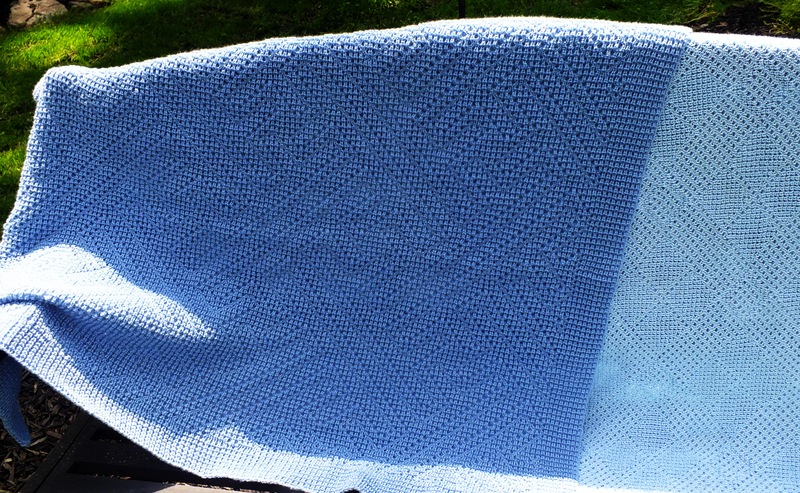 I made this baby afghan lovely yesterday. I told my husband I was making it for someone and needed an hour of uninterrupted time. I surprised myself since I finished it in 32 minutes…..without a motor. Now, I have shown this before and directions are posted in my blog. I have to tell you why I made it. My friend and I were in JoAnn fabrics and I saw a pattern for sale for an 18 inch doll. (Sister’s granddaughter has one and now making clothes for it) I asked the clerk if the sale included the doll pattern and she said she thought so but to check on the price check scanner in the store. I did and got the shock of my life. The pattern was on sale at 50% off and the sale price was $13.70!!!!! I put it back and my friend and I started to have a discussion about how expensive patterns are nowadays. A woman approached the two of us and said she could not help but overhear our discussion abut the prices of doll clothes patterns. She then told us she has a ton of them at home along with her sister’s collection and we were more than welcome to them for free if we come and get them. She said she would like to know that someone used them instead of throwing them away. Whooooo Hoooooo……so we are going tomorrow to pick them up. So in talking to her she said her eyes are failing and she does not sew too much any more and all of the children are grown. She mentioned that a grandson was born in the family a month ago. 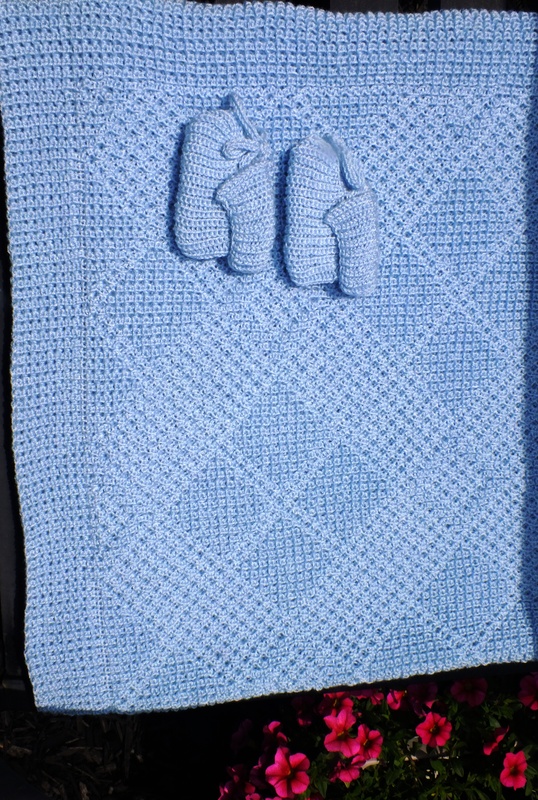 So I decided since she was not charging us, I would make this afghan for her to give for the little baby boy. 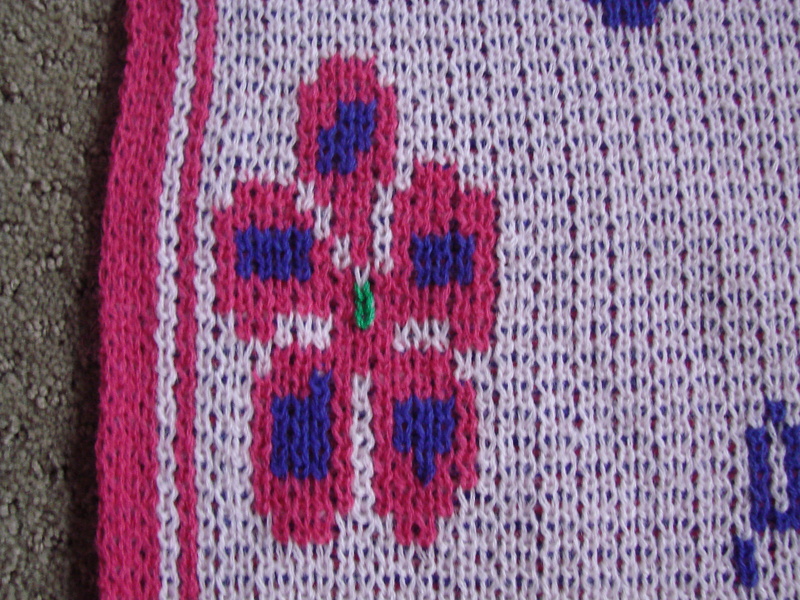 Passap Afghan with Borders using the Console without Downloading into it. You can use any fairisle pattern no matter what the pattern size. If it is a smaller pattern you just have to enter it several more times than a larger one. If you make this you will start to see how it is done. 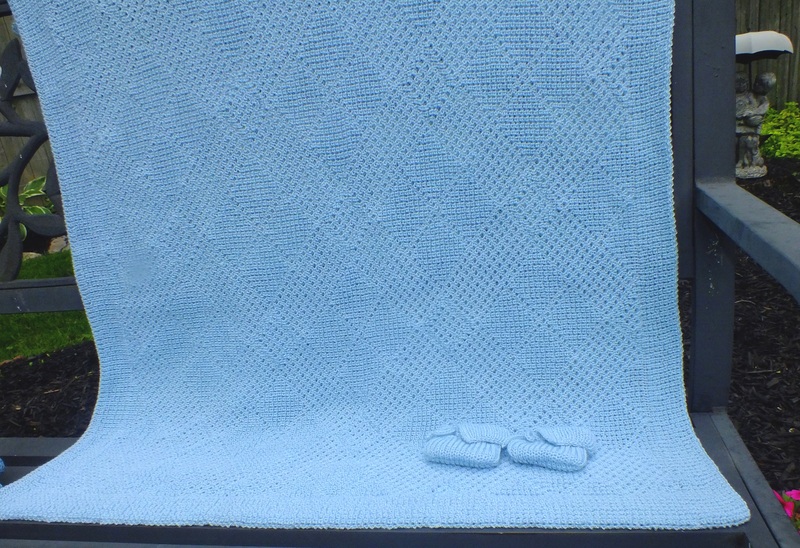 In these afghans the patterns are 40 stitches by 40 rows. On each of the afghans I repeated the pattern 3 times for width and that is 120 stitches. 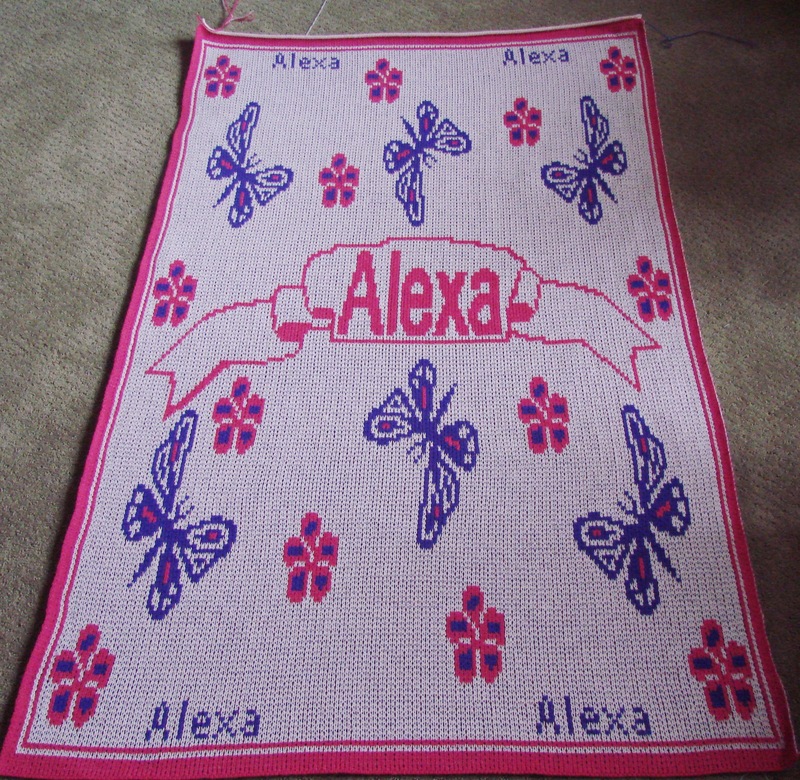 Then I added 9 stitches on each side for the border. You can go wider than that if you want to. I was making a baby afghan. Then I repeated the design 3 times row wise making 160 rows times 3 =480 rows. I did 32 rows of the border at the beginning and at the end. Here are the complete programming directions for you in my drop box. A WORD TO THE WISE; If this is your first time doing this enter your information on the console. Set up the needles and test the pattern. Start your program .On the border pattern all the needles will be in work. Then push the COR button and agree to 69- and 69 plus for the needles. Then when it tells what row you are on enter row 30 and wait for a reset . 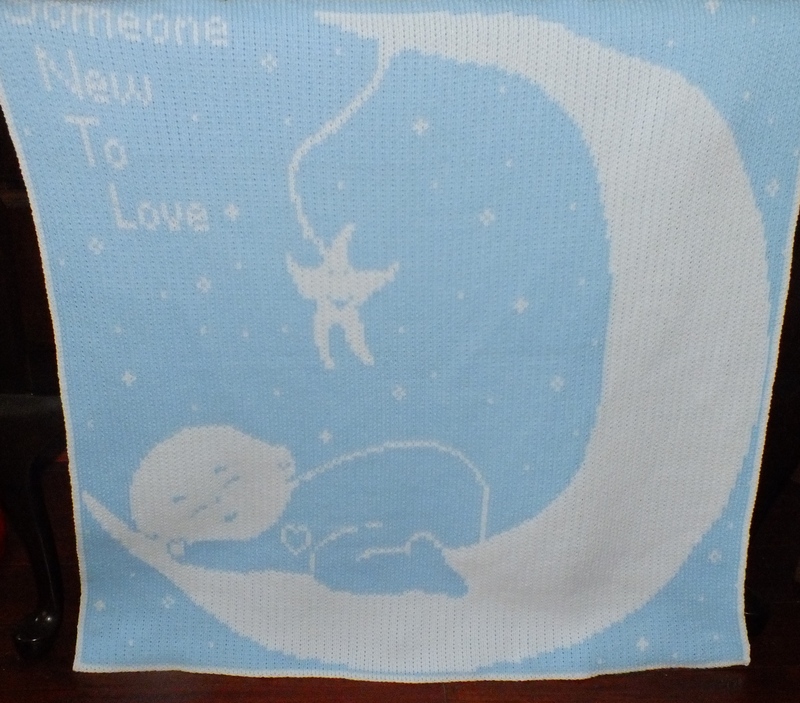 Go through that set up and when it says row 30, knit two more rows(that is the border) the blanket design will set up on the last row you knit. You will see 9 side stitches on each side(or ten if the middle design is in work)for the side borders and all of the needles in the middle will have a pattern. If not there is an error. HOWEVER, if when you program the console says 120 stitches and 160 rows, you should be okay. My next sample will be using technique 187. Now I know why I buy patterns instead of making them. I have a great appreciation for people that do this. I have been working on this pattern for three days. 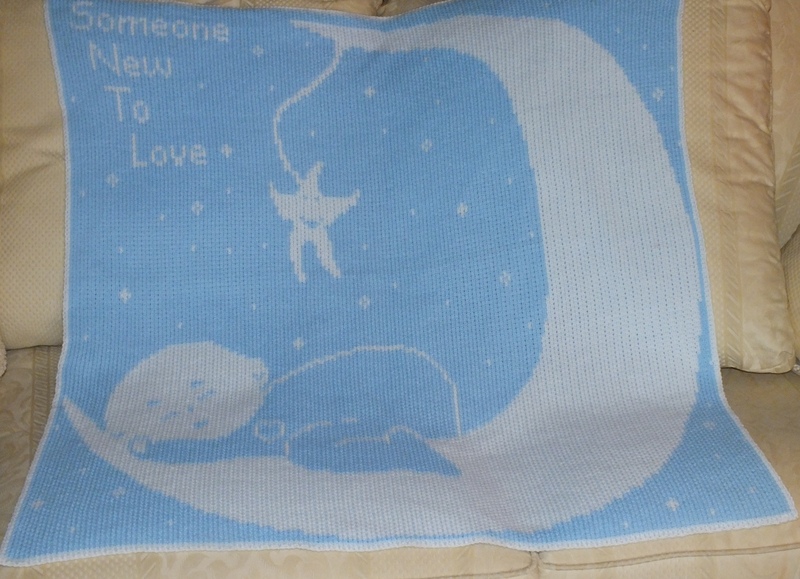 On my first pattern I knitted it a third of the way and the moon was too narrow and the babies’ head was too big. I also had the words Someone New in the upper left hand corner and the words To Love in the lower right hand corner. I started over and this is what I came up with. I can see that I can take more rows out of the moon right where the star is and then shorten the star. 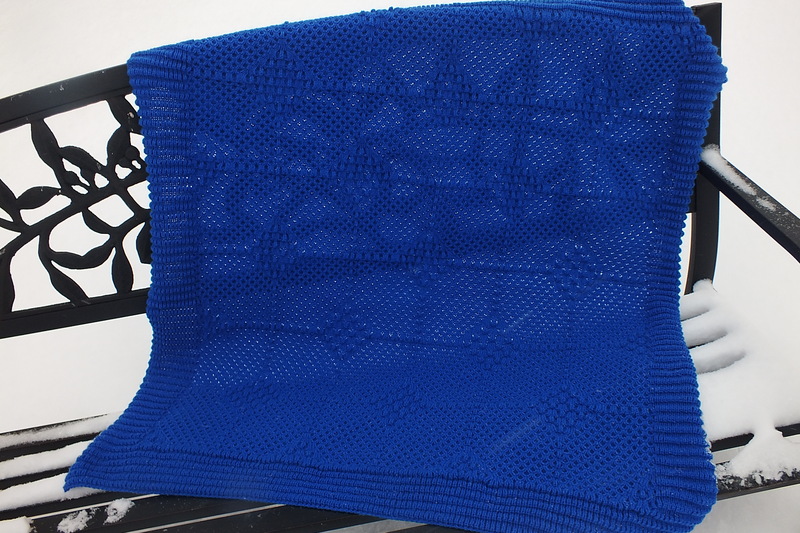 I used 165 needles and knitted 600 rows and the afghan came out a square. It is 33.5 in width and length. 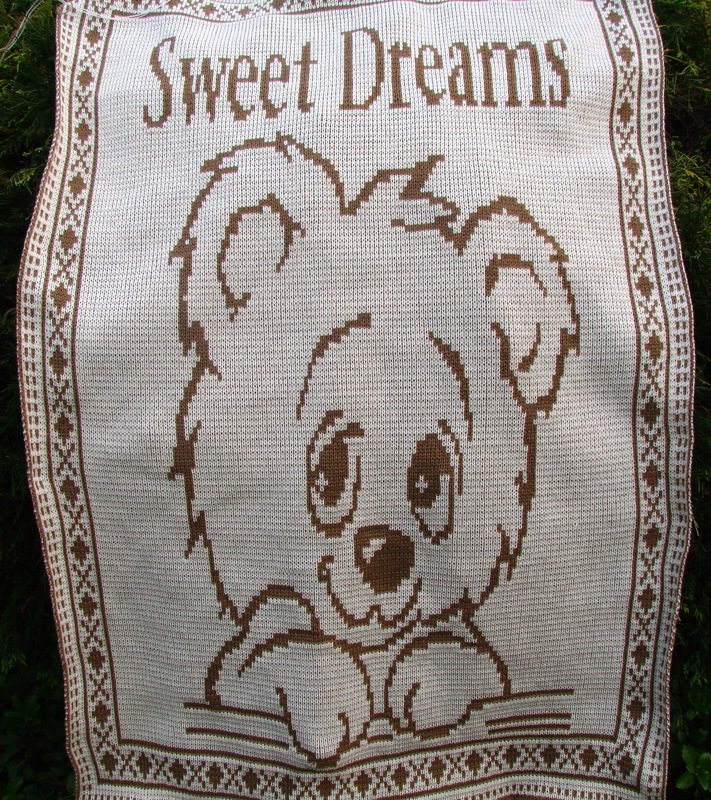 This pattern is in Machine Knitters Source Magazine May/June of 1998 Vol. no 84 This pattern is in two parts in the magazine and intended for Creation Six. Okay, so how do I get the pattern . 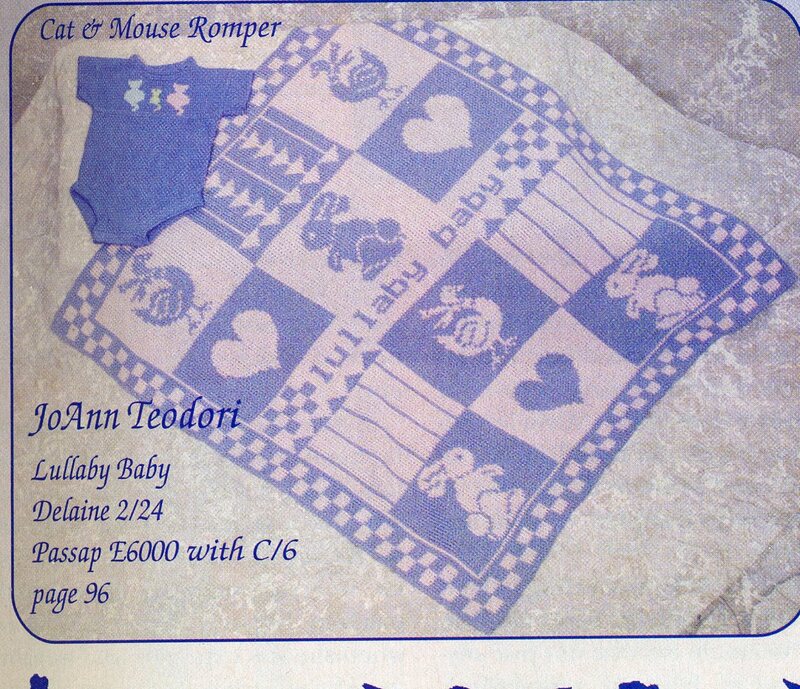 I was reading an old magazine and it said if you want to scan a picture to convert to knitting, scan at 100dpi. So I set the magazine on my scanner and lowered the dpi. Then I saved it into DAK. The bunny and the bird came out so I copied and pasted into a new file. I went back to the original and I could tell where the arrows were. To make a long story short I was able to put it together into a file. My heart does not look as wide as hers but I think it is okay. If you want to change it in the pattern that I am sharing with you in my drop box, you can. I was ready to knit it and realized I did not want a big blanket. So I worked on a smaller one and that is what is pictured. The small size is 26 width, 32 length. If you want to use the tension she suggests which is one dot higher than I used, it will come out a little wider. If you want to add more columns, add one more column at each side to make the border 3 stitches instead of two. My blanket is 135 stitches by 148 rows. If you add more columns, remember to select the right needles. You will knit 592 rows and 2 rows for bind off. 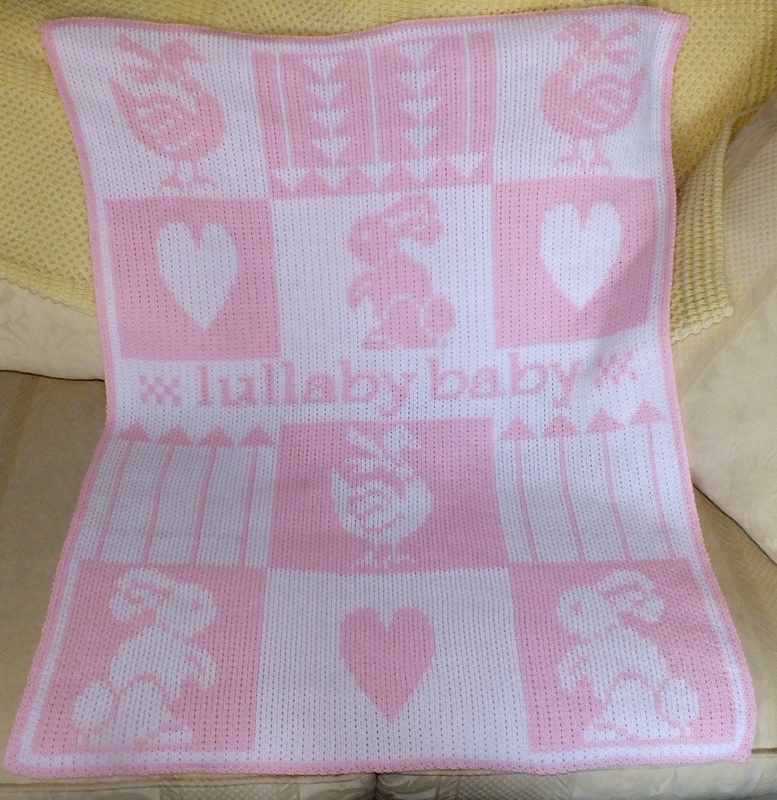 Her blanket is 704 rows and 2 bind off rows. I have the large blanket and smaller blanket in bmp and cut files. There is also a word document on how I made mine and how she makes hers. Hope you try it and have fun. I think it is cute. 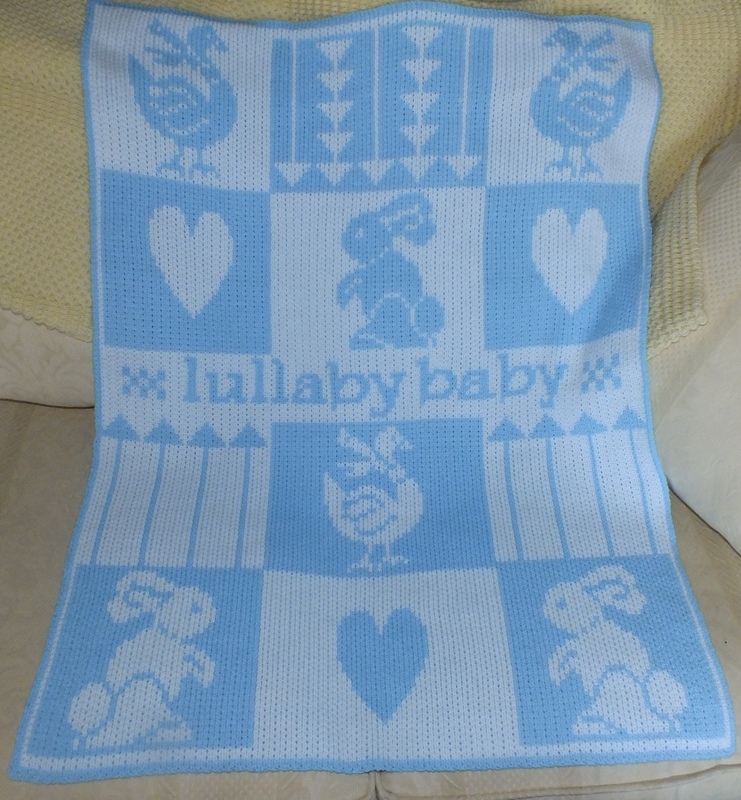 Will have to go look through some more magazines and see if I find some more baby afghans. Please look over the larger pattern if you do it and search for mistakes. I don’t think there are any but my eyes cross after looking at the computer screen for so long. I have a box of magazines and patterns I wanted to get rid of and while waiting for my hubby to go somewhere, I picked up Machine Knitters Source July/August of 2001 and leafed through it. I came across this pattern by Jean Curry and I think it is beautiful. I like it better than the afghan lovely. 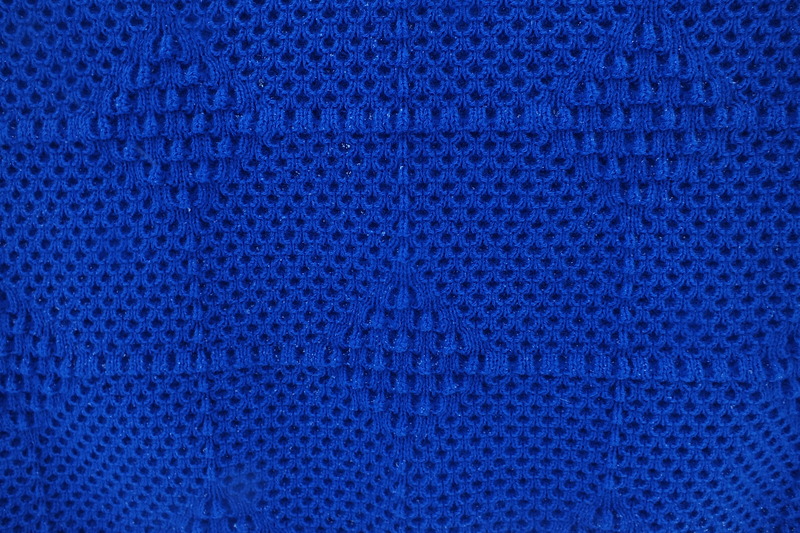 The stitches are raised and look like the popcorn stitch. The pattern was not a graph to put into DAK or win/crea so I tried to scan it. Didn’t work. Then I took a close up photo of it and put it in DAK. In the conversion I was able to get one complete diamond. So I opened a new stitch file and copied and pasted the diamond in. It took me two hours to complete but after making it, it is a keeper. Glad that I spent the time. I was stumped by pattern though because it says 162 rows and I only came up with 161. Well, if I had read to the end of the pattern, I would have seen that the last row is the bind off. I followed her directions for the cast on and I really like it . It is the racking cast on. I downloaded the pattern and when I realized how large it would come out and that it needed 15 ounces of yarn, I had to stop. That is a very large blanket. So I went back to the program and reduced the size to 142 rows by 138 stitches and it came out the size that I wanted. Finished size is 36″by 38″ . I also added one more tuck row so the borders would look alike. I am glad that I did. I corrected the pattern and if you go to my drop box link you will see two files in bmp format. 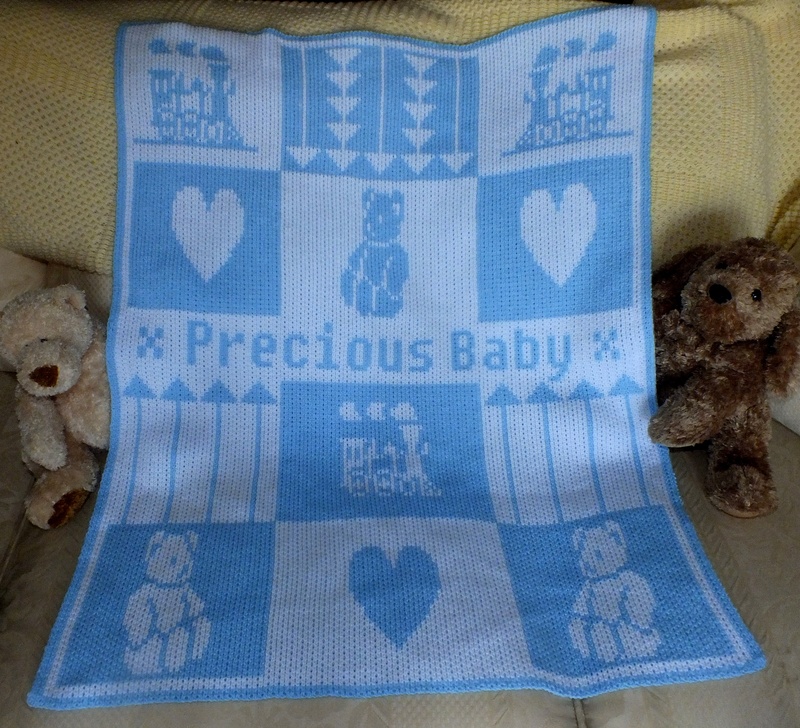 One is the original size and the smaller one is the one that I made for baby afghan.They can be downloaded and taken into win/crea if you want to try this. In the drop box at the bottom is a document on how I made the smaller one.